WALTONIA (3f Bel Esprit x Docalady by Stravinsky) headed to Benalla on the back of a strong first up win at Warrnambool a fortnight earlier against 3 year old fillies. 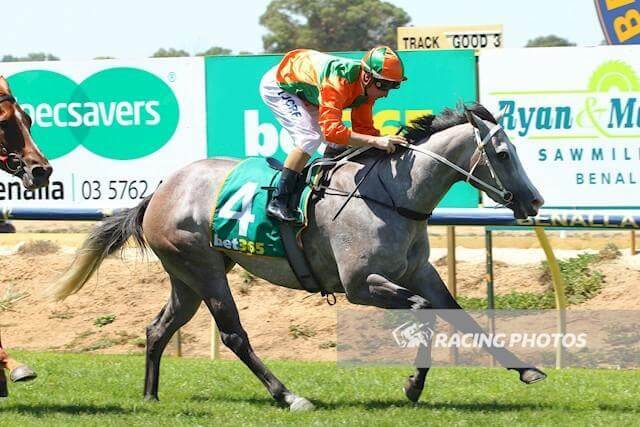 She had to step up out of maiden class for the first time and take on the open age horses in this race at Benalla. Daniel Stackhouse was keen to stick with her and he made the trip up the Hume Highway to take the ride. Despite an early speed battle upfront, Daniel was able to get Waltonia to settle outside the leader after crossing from the outside barrier. Waltonia travelled strongly throughout and when they straightened up she looked like the winner. When Daniel asked her to extend she quickly raced to the front and she maintained her speed to the line to score her second win in a row. Waltonia has certainly taken significant steps forward this preparation after spelling and being pre-trained at the O’Brien family owned, Lauriston Thoroughbred Farm in Corinella, Victoria. We were fortunate the O’Brien family sent us this Bel Esprit filly to train and we’re looking forward to racing our 2 year old So You Think colt with them in the future. With 2 strong wins from 2 starts on the provincial circuits this preparation, we will look to give Waltonia her opportunity at metropolitan level in the coming weeks. She still looks to have improvement to come and hopefully she can continue to progress through her grades.